The RAW video plays, and we go live into the Staples Center to see a big pyrotechnics display. Tonight, we’ll see Charlotte defend the RAW Women’s Championship against Sasha Banks. We’ll also see Brian Kendrick take on T.J. Perkins in a non-title match. Finally, we’ll see a sit down interview with Seth Rollins. Roman Reigns’ music hits, and he makes his way to the ring to massive boos. Eight nights ago at Clash of Champions, Reigns defeated Rusev to win the WWE United States Championship. Reigns gets in the ring and holds up his title. Reigns circles around in the ring and says his bloodline has been represented in the WWE for a long time, but they’ve never had anyone win the United States Championship until now. That’s because he is THE guy. He comes out here and represents his family on a nightly basis. Lana’s music hits for the quick interruption. She comes out to the stage and seductively poses before continuing her walk to the ring. Lana gets in the ring and smirks at Reigns as the crowd chants, “Thank you, Lana.” Lana says she’s out here to talk to Reigns, but her husband doesn’t know. Reigns says they’re in L.A. and in the Staples Center. There are cameras anywhere. She’s the only girl to ever give Rusev any attention, so he’s sure Rusev knows where she’s at. Lana says she’s here to negotiate. Her husband is challenging him to a rematch for the United States Championship. Reigns says it doesn’t sound like a challenge. It sounds like Rusev sent her out to do his dirty work while he hides behind her skirt. Lana says Rusev is her partner and husband, which means he’s family. Reigns always talks about the pride he has in family, but he has zero respect for family. Reigns tried to ruin her wedding celebration with Rusev. Reigns laughs at her. Lana tells him to wipe the smile off his face and calls him a “stupid boy.” She says her husband will crush and humiliate him in front of the country and his family. Reigns says she’s clearly getting hot and needs to relax. She should go to the back and give her husband his Bulgarian balls and have him say it to his face. She warns him to not talk about her husband like that and tells him to go to hell. Rusev’s music hits, and he storms down to the ring. Rusev and Reigns brawl at ringside. Reigns knees him in the midsection and sends him into the barricade. Rusev powers him into the barricade before Reigns sends him back into the barricade. Rusev gets in the ring holding his ribs. Reigns sets up for a Superman Punch, but Rusev counters by tossing him to the corner. Rusev shoulders and punches away at him before missing a big boot. Reigns uppercuts him, and Rusev flees the ring. Reigns goes for a Superman Punch off the steps, but Rusev kicks him in the chest and sends him into the steps. Rusev then kicks him over the barricade into the crowd. Rusev grabs the United States Championship and holds it up. Rusev then takes it up the ramp with him and holds it up. Reigns then comes through the crowd and floors him with a Superman Punch. Rusev took a great bump on that. Reigns stands over him and says if he wants him to go to hell, he’ll take them both with him. Rusev will get his rematch, but it’ll be inside Hell in a Cell! A video highlights the rivalry between T.J. Perkins and Brian Kendrick. They’ll face each other in a non-title match, next. Brian Kendrick goes for a handshake, and T.J. Perkins reluctantly shakes it. The bell rings, and Perkins dropkicks him down. Kendrick quickly gets out of the ring, and Perkins feigns a plancha before doing the dab. Kendrick angrily gets in the ring and hits the ropes, but Perkins gives him a back body drop. Perkins uppercuts him before having a whip reversed, but he comes back with a springboard cross-body and punches away at him. Kendrick gets up and tries to send him out of the ring, but Perkins ties himself up in the ropes. Perkins then gets Kendrick out of the ring and dropkicks him before skinning the cat to get back in the ring. Perkins then hits a corkscrew plancha. Perkins gets him in the ring and goes to the top rope, but he rolls through when Kendrick moves. Kendrick then big boots him down. Kendrick takes the turnbuckle cover off and puts his fingers through the metal connector. Kendrick steps on the hand and gives him a neckbreaker over the top rope. Perkins falls to the floor and holds his neck. We come back from the break to see Kendrick get out of a headlock and send Perkins head-first into the turnbuckle. Kendrick goes to the second rope, but Perkins punches him and gives him a super hurricanrana. Both men are down. Kendrick gets to his feet, but Perkins catches him with an inverted atomic drop and a spin kick. Kendrick reverses a whip to the corner, but Perkins slingshots over him and takes him down with a running hurricanrana. Perkins catches him with a double chickenwing into a gut-buster, but Kendrick kicks out. Perkins quickly applies a kneebar, but Kendrick quickly gets to the bottom rope to break the hold. Kendrick counters a whip before kicking him in the face. Kendrick then pulls him face-first into the turnbuckle before hitting Sliced Bread #2 for a near fall. Kendrick is stunned her didn’t get him. Kendrick then applies the Captain’s Hook, but Perkins counters into a pin to break the hold. Kendrick runs into a kick, but Perkins gives him a drop-toe-hold into the ropes. Perkins connects with a Wrecking Ball Dropkick. Perkins goes for a Detonation Kick, but Kendrick rips the nose and gets out. Kendrick then applies the Captain’s Hook for the submission victory! Coming up next, we’ll see a sit down interview with Seth Rollins. A pre-taped interview is shown with Michael Cole interviewing Seth Rollins. Cole asks about the rib injury. Rollins says the doctors cleared him and advised rest, but that’s not his thing. Cole says the issue with Kevin Owens has escalated. Rollins says Owens won the Universal Championship, but he didn’t beat him. Triple H handed him the title. After what happened at Clash of Champions, there’s no question that he deserves a rematch. Cole says Owens’ rise to prominence is parallel to Rollins’. Rollins says he made a lot of enemies with people in the locker room and the WWE Universe to get to the top. How they got to success is the difference. Owens is the teacher’s pet that kissed up and got the gold stars. When he cashed in Money in the Bank at WrestleMania, no one handed that title to him. That was years of hard work paying off. Everyone has a Kevin Owens in their life. Unfortunately, he has THE Kevin Owens. Cole mentions that his relationship with Triple H is well chronicled. How does it feel about being replaced? Rollins says you can’t replace him. Owens is good, but he’s just a cog in the machine. Rollins has been a cog in the machine and understands what that feels like. His eyes are wide open right now. He sees things completely differently, and he’ll tear that machine apart piece by piece. Cole mentions at Clash of Champions, Owens retained with interference by Chris Jericho. How is the rematch going to play out? Rollins says he had Owens beat at Clash of Champions, but he’s not stupid. He understands how the game is played. Stephanie McMahon brought the referee out at the right time, and Owens took advantage. Rollins says he’d have done the same thing. How will it play out if there’s another rematch? Rollins says he’ll cancel “The Kevin Owens Show,” and he’ll prove that he’s still the man. Kevin Owens will respond to Seth Rollins’ interview later tonight. The WWE has gone pink for Breast Cancer Awareness Month. They’re raising money for the Susan G. Komen Foundation. Byron Saxton is in the ring with Braun Strowman’s opponent. Saxton asks why he signed up for this match. Chase Silver says he’s here from Idaho to come to L.A. where dreams come true. Last night, he had a dream that he’d beat Strowman up. The bell ring and Strowman just hungrily stares at him. Silver kicks and punches him before Strowman pushes him into the ropes and avalanches him down. Strowman asks if this is the best L.A. has to offer. Silver attacks him from behind, but it doesn’t hurt him. Strowman kicks him down and throws him into the corner before avalanching him. Strowman hits the ropes and avalanches him again. Strowman screams at him before waiting for Silver to get up. Silver slowly gets to his feet, and Strowman runs him over with a shoulder block. Strowman scoops him up, walks around the ring with him on his shoulder, and powerslams him down for the win. Byron Saxton gets in the ring and interviews Strowman. Saxton asks what’s next after his continued dominance. Strowman says he’s the gift of destruction and his talent is being wasted on these weak fools. 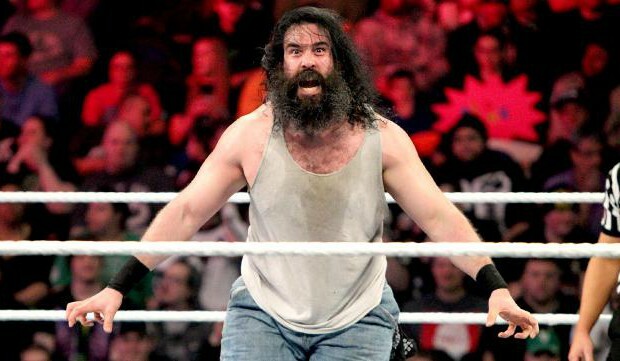 If Mick Foley doesn’t get him some real competition next week, there won’t be a next week. Strowman shoves Saxton and walks off. Sasha Banks is warming up backstage. Bayley walks up and says she can’t believe Sasha is main eventing RAW against Charlotte. That’s Trish and Lita territory. Sasha says the little kid in her is freaking out, but this a lot more than being in the main event. Tonight is about taking back the championship. Critics say she doesn’t have a chance, but she wouldn’t be here in L.A. if she listened to them. Bayley says she wishes it was her out there, but it isn’t. She couldn’t think of a more deserving person than her. Sasha thanks her. She knows Charlotte will be on her game, but she’ll dethrone her. Charlotte was born into the business, but she’s born to be a champion. Coming up next, we’ll hear from Kevin Owens about Seth Rollins’ interview. The 2017 Royal Rumble will take place at the Alamodome in San Antonio, Texas. It’s official: Roman Reigns will defend the WWE United States Championship against Rusev inside Hell in a Cell. Kevin Owens’ music hits, and he makes his way out to a nice reception in a suit. Chris Jericho is behind him holding “The List of Jericho.” Jericho puts an audience member on “The List” as he comes down the aisle. A “Y2J” chant breaks out as they stand in the ring, so Jericho starts writing on “The List.” Owens says he just watched Seth Rollins’ interview with Michael Cole and mentions that Cole was terrible. Owens says if Rollins was smart, he’d sit on the sidelines and let his ribs heal, but Rollins isn’t smart. He’s a stupid idiot because he’s decided to throw caution to the wind. Rollins has requested a rematch for his WWE Universal Title. What has Rollins done to deserve that rematch? Rollins can talk about how it all went down at Clash of Champions, but the undeniable truth is that Rollins lost. Rollins can blame whoever he wants for that loss, but if he wants to blame someone, he’s just got to look right here in the ring. Owens is the one that beat him. Tonight, he’s the one standing in the ring holding the WWE Universal Championship. Now that he’s answered that question, he’ll answer another one. Why is the great Chris Jericho standing by his side in the ring? Jericho says it’s because they are the best of friends. Owens says that’s true, but that’s not why he asked him to come out here. Owens says Rollins has blamed the referee for not being there at Clash of Champions. A “Stupid Idiot” chant breaks out. Owens says they think they’re being cool, but they’re really being stupid idiots. If Rollins wants a match, they should have a referee that can handle everything. Jericho should be the referee in the match. Jericho says it’s not a terrible idea, and he does have his own referee jersey. Owens says it’s a $750 jersey, and Jericho says it’s very expensive. Jericho says he’s been doing some thinking and thinks Owens is being short-sighted. Last week, after they beat Enzo and Cass in the middle of the ring, it made him realize that Team Chris and Kevin are the best in WWE. Jericho says they should challenge The New Day. A “YES” chant breaks out, and Jericho tells the crowd to shut up. Owens says Team Kevin and Chris as RAW Tag Team Champions sounds great, but Cesaro and Sheamus have an opportunity lined up. Jericho laughs and says they’re not best friends. They’re not even friends. Maybe they challenge New Day to a non-title match and beat them. Then they’ll face them for the titles and win. They’ll make history by being the WWE Tag Team and Universal Champions at the same time. Owens says he has a lot on his plate. Jericho says it’s not like he’s asking for an opportunity at his championship. The crowd gasps as Jericho looks at the title. A “Y2J” chant breaks out. Owens thinks about it and agrees to go after New Day! The New Day comes out to a big reception and toss some Booty O’s into the crowd. Kofi Kingston says he knows that the two of them weren’t talking about friendship because around here, they’re the ones with the best friendship in WWE. Jericho says if Kingston is questioning their friendship, he’s made it to the list! Big E says they’ve heard their challenge, but a challenge of that weight warrants a champion huddle. Jericho isn’t allowed in. Jericho says since he’s not allowed in the huddle, he just made the list! Owens says Xavier Woods laughed, so Jericho adds him to the list despite Woods’ protests. The New Day starts to huddle. Owens says they know what they want. If they don’t give it to them, they can leave so the truly most entertaining team in WWE can do their thing. New Day won the Tag Team Titles and held them for 400 days and sarcastically says, “Good job.” Together, they’ve compromised the health of children by giving them questionable cereal. Seven months ago, they all jumped the shark. Woods says they do not swim. Secondly, when was the last time Owens jumped over anything. The crowd pops huge for that as New Day flips out. Owens orders Jericho to put him on the list a second time! Woods says they were going to leave and watch The Magnificent 7 or Luke Cage, but since they want to throw hands with them, they’ve got their match. They’re clearly not dressed to fight, so they’ll get some time. They just need to remember one thing: they’ll never beat The New Day to become their WWE World Tag Team Champions. Big E says, “Because… New Day rocks!” A “New Day Rocks” chant breaks out while Woods plays the trombone. Earlier today, Sheamus drove into the Staples Center with Cesaro in the passenger seat. They argued as soon as they got out of the car. Cesaro threw his bag out of the car. Tonight’s main event will see Charlotte defend her RAW Women’s Championship against Sasha Banks. Ryan Phillippe is at ringside and gives the DX crotch chop. It’s official: The New Day will face Jeri-KO tonight on RAW. The bell rings, and O’Neil powers him to the corner. Zayn ducks a right hand and applies a side headlock. Zayn springboards over him and chops him before O’Neil punches him. O’Neil puts him on the apron, but Zayn comes back with a shoulder to the midsection. Zayn slingshots into the ring and goes for a cross-body, but O’Neil catches him and hits some rib-breakers before throwing him down. O’Neil chops the chest and forearms the back. O’Neil viciously whips him into the corner and mocks him. O’Neil applies a bear hug, but Zayn punches out. O’Neil quickly gets him over his shoulder and connects with a modified backbreaker. O’Neil talks some trash and slaps him. O’Neil hits the ropes, and Zayn gives him a stiff clothesline. Zayn catches him with an exploder suplex into the corner. Zayn follows up with the Helluva Kick for the win. Sheamus and Cesaro are fighting about being late to the show. Cesaro says Sheamus was driving. Sheamus says Cesaro guided them into rush hour traffic. Mick Foley walks up to them and says he was thoroughly humbled by Stephanie McMahon last week and now has a vague Braun Strowman threat hanging over him. He had them ride together to get them to be on the same page. Last week, they won, but they weren’t on the same page. Foley orders them to get on the same page. Coming up next, Anderson and Gallows will be in action. A pre-taped promo is shown with Anderson and Gallows. Karl Anderson says The New Day has ruined the tag team division. Luke Gallows says they’ll push the clown car off the cliff. Karl Anderson will start the match against R-Truth. R-Truth does a dance, ducks a clothesline, and connects with a hip toss. Goldust is tagged in, and they hit a double-team leg sweep. Goldust drops a forearm and wrenches the arm. Anderson knees Goldust in the midsection and lowers his head, but Goldust drops down and uppercuts him. Goldust ducks a clothesline and clotheslines him before hitting an arm drag. Anderson powers him to the corner, but Goldust punches out. Anderson takes him down and tags in Luke Gallows. Gallows viciously punches away at Goldust and kicks him down for a near fall. Gallows elbows him in the chest a few times before applying a chin lock. Goldust fights up, but Gallows knees him in the midsection and punches out. Goldust then hits a snap powerslam. Anderson and R-Truth are tagged in. R-Truth hits a pair of clotheslines and a jumping heel kick. R-Truth does a split and kicks him before hitting a Scissor Kick. Gallows breaks up the pin and knocks Goldust off the apron. Anderson powers R-Truth to the corner and tags in Gallows. Gallows kicks R-Truth, and they hit the Magic Killer for the win. Goldust comes in to check on R-Truth, but he’s attacked by Anderson and Gallows. Gallows big boots him before they hit him with the Magic Killer. Anderson and Gallows then angrily walk off. Kevin Owens and Chris Jericho are walking backstage when they bump into Ashton Kutcher and Danny Masterson. They argue about which pair are the better friends before taking “The List of Jericho” and reading some embarrassing things off it, particularly losing to Fandango at WrestleMania. Owens walks off and says “That 70s Show” would’ve been better with them. Kutcher says they’ll be at ringside for their match. Jericho warns them not to get involved in their business otherwise they’ll get… IT! Enzo and Big Cass are in the ring with some breast cancer survivors. There’s a table in the ring with a pink cover on it hiding something. A “How you doin’” chant breaks out. Enzo goes through his normal shtick. Big Cass says they’re here to talk about a very real situation, which is something near and dear to their hearts. This is the fifth year that WWE and Susan G. Komen have teamed up in the fight against breast cancer. Enzo says WWE and Susan “Certified G” Komen had a contest in March. Those women that were nominated are in the in the ring. We got a couple of “winnas” in the ring. Gina Foreman, Kelly Sherman, and Angelica Frye are survivors. These are the women in the ring with them. You can see these women all month long as they share their stories with all of them. Enzo says it’s a spoiler alert that these women have already won their fight against breast cancer. These women are champions. The way they honor champions in WWE is by giving them titles. Enzo pulls the blanket off, but the titles are tangled up in them. They hand them the titles and put them over big. The crowd gives them a great reception. Big Cass says one word doesn’t describe the women in this ring and he’ll spell it out for them: S-A-W-F-T.
Tonight’s main event will see Charlotte defend the RAW Women’s Championship against Sasha Banks. Coming up next, The New Day will face Jeri-KO. Ashton Kutcher and Danny Masterson are on commentary for the next match. Chris Jericho will start the match against Xavier Woods. Kofi Kingston is at ringside for this one. They circle the ring, and Jericho kicks and punches him. Jericho chops the chest, and Woods accidentally cracks Jericho in the nose. Jericho is concerned his nose might be broken. Kevin Owens is tagged in, and he scoop slams Woods before jumping over him a few times. Owens goes for a senton splash, but Woods moves. Owens puts Woods in the corner and punches away at him before kicking him down. Owens talks trash, but Woods responds with some punches. Owens gets him in the corner, and Jericho feels well enough to tag in. Jericho gives him a stiff kick and slaps him. Woods avoids some clotheslines, but Jericho kicks and chops him. Woods boots Jericho in the face and hits the Honor Roll for a near fall. Jericho quickly scurries over Owens. Jericho is bleeding from the nose. Owens tags back in, and Big E is tagged in. Owens attacks Big E and punches away at him before hitting the ropes. Big E avalanches him and does a jig. Big E punches away at Owens before sending him to the corner. Big E hits a running shoulder before sending him to the opposite corner. Owens avoids a shoulder, so Big E hits the ring post shoulder-first. Jericho is tagged in, and he chokes him before taunting the crowd. Jericho slaps Big E a few times, so Big E returns the favor in kind. Jericho comes back with a dropkick. Jericho talks trash to Woods while Owens cheap shots Big E. Jericho clubs away at Big E before going to the top rope. Jericho comes off, but Big E punches him out of mid-air. Jericho quickly takes him down before Owens is tagged back in. Owens hits a cannonball in the corner and taunts the crowd before picking up a two count. Owens circles around him and hits a senton splash for a near fall. We come back from the break to see Owens and Big E take each other out with a double clothesline. Woods is tagged in, and he knees Owens in the face before clotheslining him down. Woods kicks him and puts him on the middle rope before hitting a dropkick. Woods dropkicks Jericho off the apron before Owens gives him a gut-buster for a two count. Owens kicks him in the back a few times and talks trash to Kofi Kingston. Owens kicks Woods in the back and applies a chin lock. Woods eventually fights up and tries to tag Big E in, but Owens stops him with a short-arm clothesline. Jericho is tagged back in, and he punches him down. Jericho clotheslines him in the corner and puts him on the top rope. Jericho shouts at Ashton Kutcher. Jericho goes for a superplex, but Woods counters out with a super front suplex. Woods then hits a cross-body block for a near fall. Owens is tagged in, and Owens DDTs Woods for a two count. Seth Rollins’ music hits, and he walks out to the stage. Owens is furious. Woods then takes him out with a step-up enzuigiri. Jericho and Big E are tagged in. Big E hits a pair of belly-to-belly overhead suplexes. Jericho kicks him in the face and goes to the top rope, but Big E catches him with a Belly-To-Booty Suplex. Big E goes for a big splash, but Owens superkicks him. Owens charges, but Big E gets him out of the ring. Woods then takes him out with a summersault plancha. Jericho rolls Big E up for a two count. Big E elbows him down and hits a big splash. Woods is tagged in, and Owens snaps Big E off the top rope. Woods elbows Owens as he gets into the ring. Jericho applies the Walls of Jericho, but he releases it when Seth Rollins runs down to the apron. The New Day then catches Jericho with the Midnight Hour for the win. Owens retreats up the ramp, leaving Jericho in the ring with New Day and Rollins. Rollins then hits Jericho with a Pedigree. Owens looks furious. Footage is shown from earlier in the night when Roman Reigns challenged Rusev to a Hell in a Cell match. That match is made official. Coming up next, Rich Swann will face Tony Nese in Cruiserweight action. A highlight video is shown for Rich Swann. Members of the Los Angeles Rams are shown at ringside. Josh Reddick of the Los Angeles Dodgers is also ringside. Seth Rollins is walking backstage when Stephanie McMahon stops him. She asks what he was doing out there. Rollins put himself at risk and isn’t medically cleared. Rollins says she can’t tell him what to do anymore. If Kevin Owens and Chris Jericho think they’re going to have a fairy tale ending, no one was listening. Stephanie says Rollins is all alone. For the first time in his WWE career, he’s all alone. No Shield or Authority. Rollins may have stood a chance before, but not now. Rollins is replaceable just like everyone else. Rollins says she can’t tell him what to do. Triple H made the second worst decision of his life by turning on him. The worst decision was marrying her. Rollins says he wants his rematch or he’s taking everyone down with him. Rollins walks off, and Stephanie smirks. The referee wants them to shake hands, so they do. Swann does some dance moves before blocking a kick and applying a side headlock. Swann goes for a takedown, but Nese holds him up and throws him off. Nese shoulder blocks him down and taunts him. Nese hits the ropes, and Swann dropkicks him down. Nese shoulders Swann in the midsection before running into an elbow. Nese backflips over him and kips under a clothesline before taking him down with some strikes for a two count. The crowd starts really buzzing for Nese. Swann gets out of a suplex and hits the ropes for a head-scissor takeover. Nese puts himself through the ropes to keep Swann back. Nese kicks him in the back of the head before kicking Swann in the corner. Nese counters a sunset flip by kicking him in the neck. Nese strikes him a few times for another two count. Nese then applies a body scissor. Swann fights out, but Nese sends him chest-first into the corner. Nese avoids an avalanche and goes to the top rope, but Swann takes him down with a leaping hurricanrana. Swann hits a pair of running clotheslines and kicks him in the midsection. Swann hits a double stomp to the back of the neck for a two count. Nese counters a handspring back elbow by slamming him into the ropes. Nese catches him with a pumphandle sit-out slam for the win. Mil Mascaras was honored for National Hispanic Heritage Month. Coming up next, Sheamus and Cesaro will be in tag team action. The makeover of Emma to Emmalina will premier soon. Cesaro takes one of them (it’s not specified who’s who) and suplexes him. Sheamus tags himself in, and he knees away at the person before giving him a release suplex. Sheamus taunts Cesaro and puts him in the corner before shouldering him. Cesaro blind tags in and has a face-off with Sheamus. Cesaro counters a sunset flip by giving him a double stomp. Cesaro and Sheamus argue. Sheamus tags in and clotheslines him before hitting an Irish Curse Backbreaker. Sheamus goes for a Cloverleaf, but Cesaro jumps off his back to give the other jobber a DDT. They argue before Sheamus connects with a Brogue Kick and picks up the win. Coming up next, Charlotte defend the RAW Women’s Championship against Sasha Banks in tonight’s main event. Charlotte is walking backstage when she bumps into Bayley. Charlotte mocks her. Bayley says she shouldn’t be too cocky. Charlotte says he title is talking too loudly. She needs to go main event. Dana stays behind and mocks her before putting her hands on Bayley. Bayley shoves her hand off, so Dana shoves her into the wall. Bayley then sends her into a wall. Dana lands hard on her knees and clutches one in pain. Sasha Banks makes her entrance. The main event is next. They lock up, and Charlotte shoves her down. Charlotte goes for the Figure Eight, but Sasha kicks her out of the ring. Sasha goes for a suicide dive, but Charlotte punches her back. Sasha gets away from her and connects with a suicide dive. Sasha seemed to be going out at a weird angle, but Charlotte straightened her out. We come back from the break to see Sasha trapped in a surfboard stretch. During the commercial, Charlotte knocked Sasha off the top rope and sent her head-first into the barricade. Back to live action, Sasha fights up and gets out. Charlotte pulls her down by the hair and picks up a one count. Charlotte forearms her in the corner and bends her over the top rope while pulling the hair. Charlotte picks up a two count for this effort. Charlotte bends her over her knee and looks for a submission. Sasha counters out by kneeing her in the head. Sasha punches her back before Charlotte shoves her. Charlotte connects with a backbreaker and puts her in the corner. Sasha avoids a running shoulder in the corner. Charlotte comes back with a chop to the chest, but Sasha blocks one and chops back at her. Sasha ducks a clothesline and hits two of her own before connecting with a dropkick. Sasha blocks a big boot and kicks her in the face. Sasha then hits a double knee takedown for a two count. Sasha ducks a clothesline and takes her out of the ring with a running hurricanrana. Sasha baseball slides her and gets on the apron. They botch a move, so Charlotte plops her on the apron. Charlotte gets in the ring and picks up a two count. Sasha counters a Figure Eight into a Bank Statement attempt. Charlotte fights up and puts her in the corner. Sasha gets her in the corner and hits a pair of a running knees. Charlotte drops her on the apron, but Sasha drives her into the corner. Sasha goes to the top rope, but Charlotte knocks her into the ropes. Charlotte boots her into the corner and big boots her down for a near fall. Charlotte cannot believe she kicked out. Charlotte gets her to her feet and chops the chest. Charlotte puts her on the top rope and goes for a superplex, but Sasha blocks it. Sasha knocks her off the top rope and takes her down with a double flying knee for a near fall. Sasha goes for the Bank Statement, but Charlotte pulls her over the top rope. Charlotte climbs to the top rope and does a corkscrew moonsault block to the floor that grazes Sasha! Charlotte gets her in the ring and connects with Natural Selection for a near fall. Charlotte is furious and near tears. Charlotte talks trash and slaps her a few times. Charlotte screams for her to stay down. Charlotte continues to slap her and sends her into the ropes. Sasha counters with a head-scissor into the Bank Statement. Charlotte rolls it to a pin, but Sasha rolls through and keeps the Bank Statement applied. Charlotte has no choice but to tap out. Charlotte screams that the title is still hers and is crying. Sasha Banks looks elated to be the champion again. Sasha holds up the title as the show goes off the air.